There’s no denying that a heart rate monitor can be a big help when you’re trying to improve your fitness, or train for a specific goal. However, high-end devices like the Polar RS800CX, or even the Polar FT80 can be overkill for someone just starting down the fitness path. Not only will a full-blown fitness computer be stuffed with features that a beginner won’t need, it will also be an expensive purchase. Thankfully there are options for the fitness technology novice. Options that won’t confuse the user with an overflow of features, and options that won’t cost the earth. 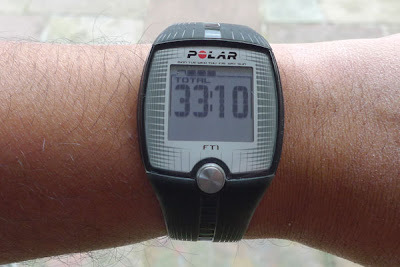 One such option is the Polar FT1 that I’ll be looking at today. Being an entry level device, the box isn’t exactly a treasure trove of goodies. 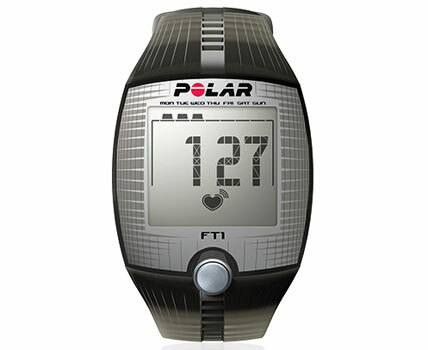 What you do get is the FT1 itself, a Polar T31-Coded heart rate transmitter and an elasticated strap to keep the transmitter in place. The FT1 isn’t the most stylish wrist computer I’ve used, but it is very slim and comfortable to wear. In fact, it would actually look quite good if it wasn’t for the silver and grey design surrounding the LCD screen. The rubberised strap has holes running along its entire length, making it easy to attain a comfortable fit. I also found that my arm didn’t get too sweaty underneath the strap, perhaps also due to the number of holes. There’s a single button mounted below the screen that controls all the functions of the device. Although not obvious at first, holding the button for a few seconds will activate a backlight, allowing you to check your progress when running at night. 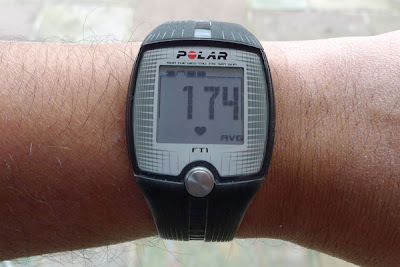 The T31 heart rate transmitter is one of the old style, plastic straps, as opposed to Polar’s WearLink+ transmitters that use an all fabric strap. The T31 is nowhere near as comfortable to wear, but clearly compromises need to be made to hit a sub £50 price point. The FT1’s feature set is quite limited – it will basically display your current heart rate while exercising, while also recording the length of your training session, along with average and maximum heart rates. Customisation is limited to manually setting upper and lower training zone limits. The FT1 will only record your last training session, so you’ll need to log all your data manually if you want to keep track of your progress. Another final point to note is that there is no alarm function, which is a little disappointing, especially since having an alarm clock on your arm is one of the main advantages of a digital watch over a more stylish analogue model. As previously mentioned, the FT1 relies on a single button to control everything. In theory this should make it simple to operate, but in practise, that’s not always the case. 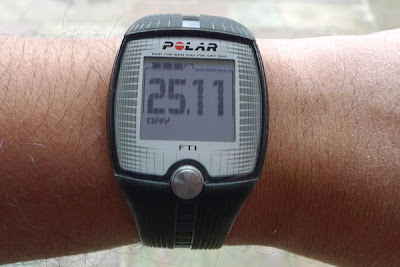 Because the single button is used for both cycling through options and selecting them, Polar has had to implement a time delay as part of the process. 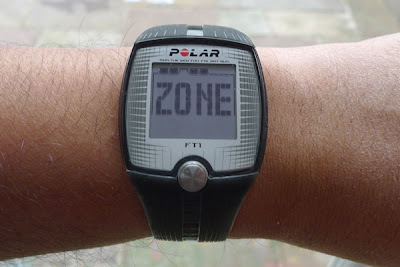 The most complicated part of the initial setup is configuring your heart rate zones. First you have to press the button three times to get to the Zone setting. Waiting a few seconds will bring up the Beep setting. You can then press the button to cycle between On and Off, but you then have to wait a few seconds before OK? starts flashing for you to confirm your setting. Once you’ve set the Beep, you move on to the High Zone setting. Here your current High Zone will be displayed and pressing the button will increase the heart rate zone. Should you want to decrease the zone, you’ll have to wait a few seconds until the minus sign shows, thus allowing each button press to decrease the heart zone. Once again you’ll have to wait until the OK? screen appears before you can move on. You then need to repeat that whole process in order to set that Low Zone. Of course this isn’t something you’ll be doing too often, but it’s slightly annoying that the whole procedure is so convoluted, when just having two buttons instead of one, would have made it so easy. Using the FT1 once you’ve set the Zones up is very simple though. Pressing the button once will display the EXE or Exercise screen. If you do nothing else, the FT1 will automatically start timing your training session and sync itself with the T31 heart rate transmitter. As mentioned, the T31 heart rate transmitter isn’t as comfortable as Polar’s WearLink+ transmitters, but it’s not what I’d call uncomfortable either. It does, however, require good contact with your chest to get a reading on your heart. This means that you need to ensure that the contacts are moist when you start training, or it will struggle to pickup your heart. Once you get going it’s not a problem – as your body warms up and you begin to sweat, you’ll maintain a solid contact. 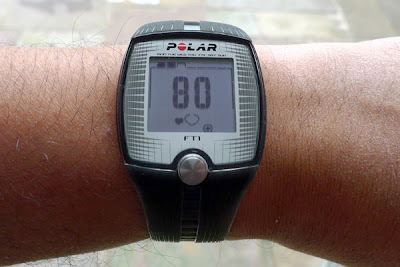 While you’re training the FT1 will display your current heart rate. If you slip outside your preset heart rate Zone, the display will flash and the FT1 will beep until you drop or climb back into the Zone. Unfortunately there’s no vibration alert for being out of your Zone, so if you’re listening to music you may not be aware of your Zone transgression. 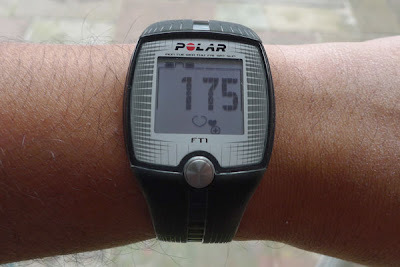 On the plus side, the T31 heart rate transmitter is compatible with most gym based cardio equipment, which means that you can monitor your heart rate on your treadmill/cross-trainer rather than constantly glancing down at your watch. It also means that you can get calorie burn information from your workout, despite the fact that the FT1 doesn’t provide such data. 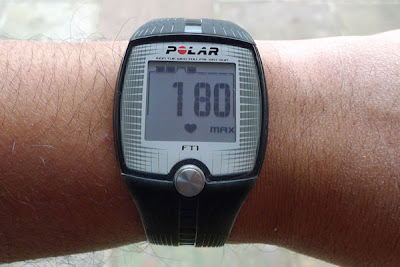 The Polar FT1 is an unashamedly basic heart rate monitor that’s aimed at people who want to start exercising more regularly and get the best from their sessions. The watch itself is slim, comfortable to wear and wouldn’t look too out of place if you wore it every day. Likewise the T31 heart rate transmitter isn’t cutting edge, but it does the job well and has the advantage of being compatible with most gym cardio machines. Configuring the FT1 is a bit of a pain, and I can’t help thinking that the decision to equip the device with a single button was something of a false economy. That said, it’s fairly simple to use, and as long as you remember to log your data after each session, the FT1 can help you track your progress as effectively as many more expensive options. Ultimately though, the annoyances can be forgiven considering that the FT1 can be found online for around £39. Anyone who’s not sure of the benefits of a heart rate monitor won’t want to spend a lot of cash, so the FT1 will be attractive based on its price alone. 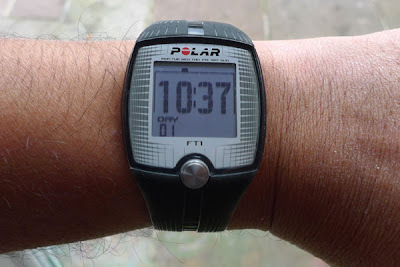 Couple that with the peace of mind that the Polar branding brings, and the FT1 seems like the perfect HRM for beginners.